Mixed Blood Theatre's world premiere of Crashing the Party is a ridiculous farce of a play, in the style of the big broad comedies of the 1930s, but dealing with very modern themes. The plot is a bit convoluted, but that's forgivable when the cast is this great and the laughs are this outrageous. The party in question is a surprise birthday party (or more accurately, a surprise family dinner) for the hard-working self-made successful businessman who's the head of this wacky family (an appropriately exasperated Joe Minjares). His wife (the divine Sally Wingert, who's equally good at drama and comedy) has become bored in her role of housewife and fondly remembers the struggling family business in which she worked alongside her husband. They have two spoiled sons who have never had to work or struggle for anything in their lives. The youngest son (the earnest Ricardo Vazquez) is fresh out of college and really wants to do something important with his life, even if he has no idea what that is. The elder son (Rolando Martinez, very funny and adorable in a Josh Gad sort of way) is 30, has several graduate degrees, owns a t-shirt business, and still lives at home with his parents. He seems to spend most of his time sitting around in his pajamas watching Jeopardy and yelling at the TV. In addition to the family unit, we also have a new girlfriend trying to impress the parents (Rose Le Tran from last year's Avenue Q), an employee who's discovered a secret (Laura Esposito), a friendly neighborhood police officer who turns out to be not quite what he seems (Ansa Akyea, who isn't afraid to bare it all), and a serious FBI agent (Mo Perry, who was so good as the victim of love in Dangerous Liaisons and is almost recognizable here). Phew, that's a mixed bag of characters that, along with corporate embezzlement, a surprise stripper, and a false arrest, adds up to some wacky fun. 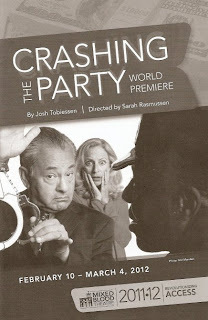 Crashing the Party is a new play by the husband/wife playwrighting/directing team of Josh Tobiessen and Sarah Rasmussen. It definitely accomplishes the goal of laughter and escapism, but also has some sweet moments of a family trying to connect. These are parents who gave their children everything, but in doing so deprived them of that feeling of accomplishment that comes from earning something on your own. The stage at the Mixed Blood is transformed into a beautifully decorated living and dining room of a home, in a rich color scheme of tan and red. A packed house (they had to bring in extra chairs to seat everyone) on a Saturday night towards the end of the run suggests good word of mouth. Audiences seem to be enjoying themselves (as did I), and the cast seemed to be having a pretty good time too. You only have one more week to crash this party.